PLAYING NOW IN A CINEMA NEAR YOU BUT IF IT ISN'T THEN CLICK HERE TO FIND OUT WHEN. As that line up there said, I'll keep it short because first this movie has been out in the US and other places for a while now and the reviews for it are positively glowing. Second, I'm feeling a little under the weather today and I think I've a headache coming round. Third, I sort of want to be all rested up for this evening when I'll be watching Hitman: Agent 47. 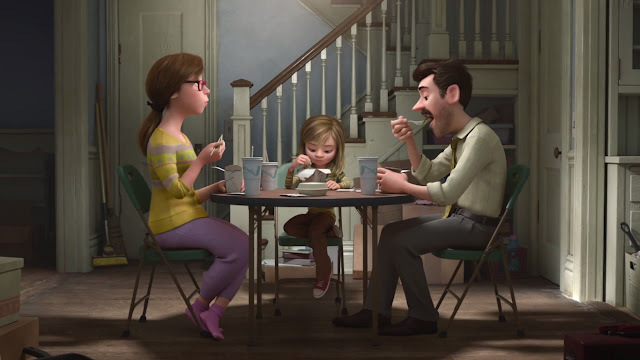 So if you didn't read the synopsis up there or want to read the very detailed summary at the Wikipedia page or actually haven't seen this brilliant piece of animated cinema it's basically a story of a little girl Riley Andersen (Kaitlyn Dias) whose family transplants from Minnesota to San Francisco and she has a hard time adjusting to her new environment. It gets so difficult for her that she even tries to runaway from her current home back to Minnesota. But the movie doesn't tell it from her perspective as much as her inner thoughts, emotions and feelings which are represented by Joy (Amy Poehler), Sadness (Phyllis Smith), Fear (Bill Hader), Anger (Lewis Black) and Disgust (Mindy Kaling). I loved this movie. Few movies move me. This movie did at the end. Inpired by his daughter growing up Pete Docter even consulted psychologists when he was coming up with the story. The way they've creatively visualized how memories are made and stored and even how our core memories create islands that reflect our personalities are brilliant. The voice acting was also brilliant. Amy Poehler and Phyllis Smith are our guides through Riley's mind and they are amazing at their roles. 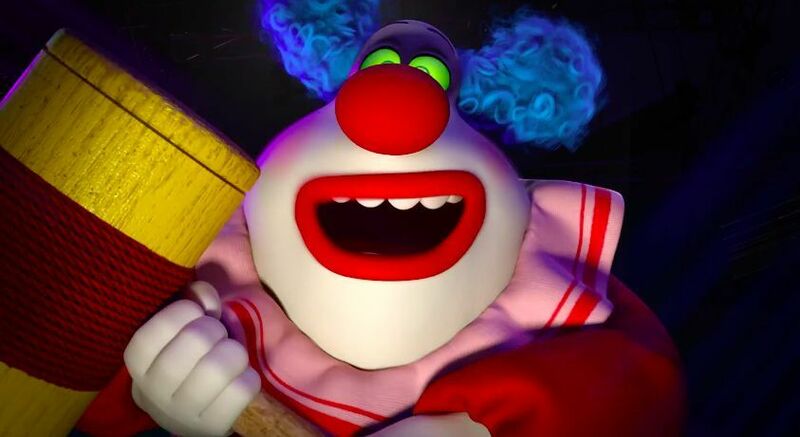 I also loved Bing Bong (Richard Kind) Riley's long forgotten imaginary friend who's trying to stay alive in her memory and then becomes Joy and Sadness's guide and finally Joy's hero as he sacrifices himself to help Joy. Every minute and aspect of this movie is enjoyable but that being said I don't think this movie is one for the kiddies. 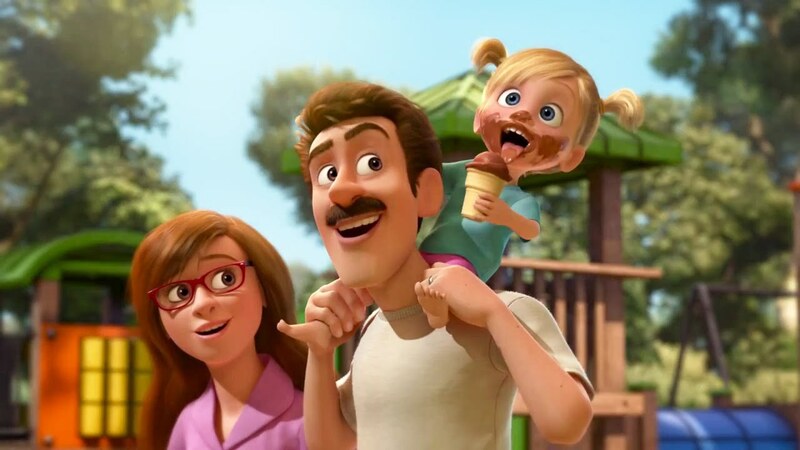 Yes, there are colorful, cute and silly things on the screen and the kids should be entertained enough to sit down quietly and enjoy it but to really enjoy this movie is to hang on to every word and expression and emotion and understand it. I'm not surprised then that so many adults i.e. critics enjoyed this movie. This movie is really for the adult who still has a child somewhere inside them. The child that much like Bing Bong trying to keep himself in Riley's thoughts and memories are struggling to remind us of our childhood and the memories made then. Of how we sometimes let our emotions take control of us even when those emotions may be the wrong one. 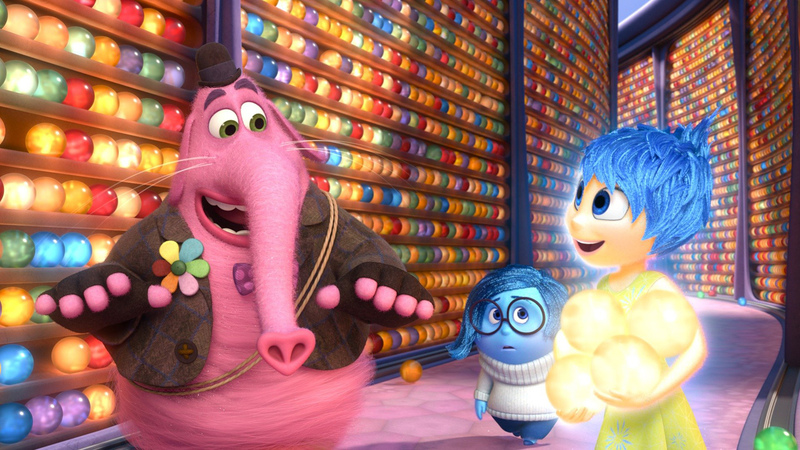 This movie helps us understand that as much as Joy is important in our lives, Sadness is equally important. Honestly speaking everyone should go watch this movie. 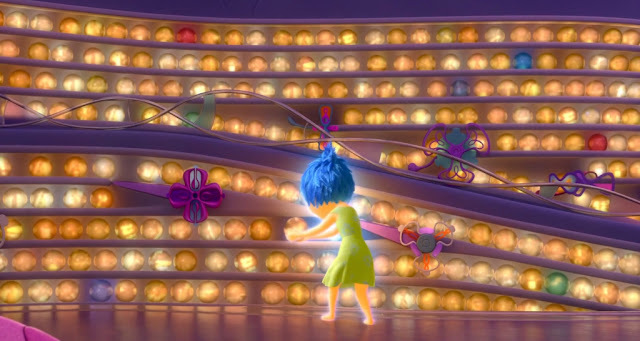 Is a lovely piece of storytelling from every aspect done the way only Pixar can do. 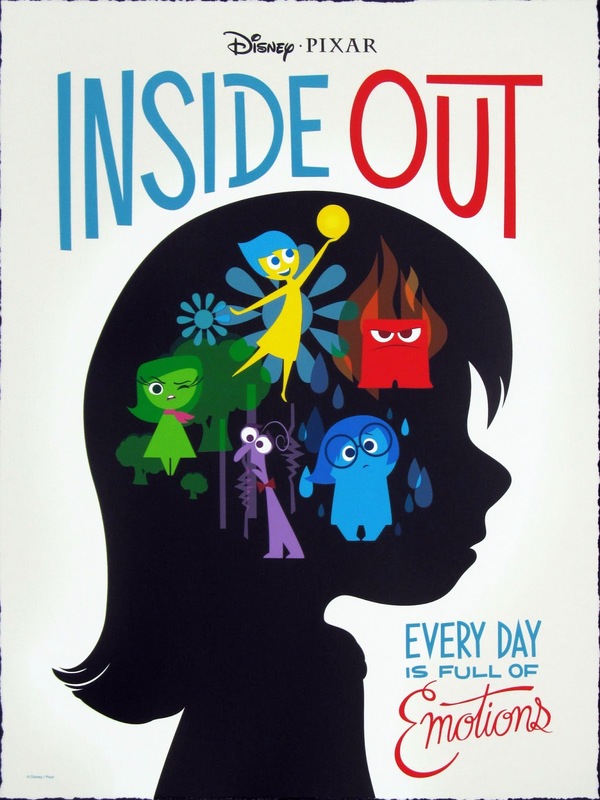 Take your kids to watch it and while you watch it let the kid in you watch too. I give this movie a good 4 out of 5. 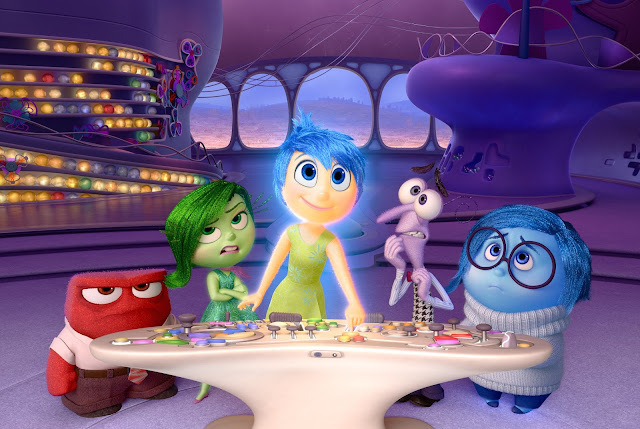 THANKS NUFFNANG AND WALT DISNEY STUDIOS MALAYSIA FOR THE #NNPREMIERESCREENING PASSES TO INSIDE OUT! AND THANK YOU GSC CINEMAS @ 1 UTAMA FOR BEING OUR HOST FOR THE SCREENING!